I had a clear vision of what I wanted to do with this chair bench…marry the formal lines of the chairs with a “welcome friends” feel. I also knew I wanted this bench to live on my porch so I could stage it for the different holidays. 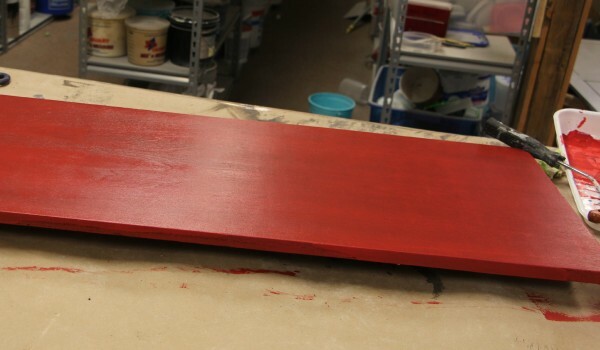 With a plan in place, it was easy for me to select the color…red with black glaze. There is honestly nothing more satisfying than taking something that has been discarded as trash or is being sold at a garage sale for next to nothing and transforming it into something unexpected and amazing. 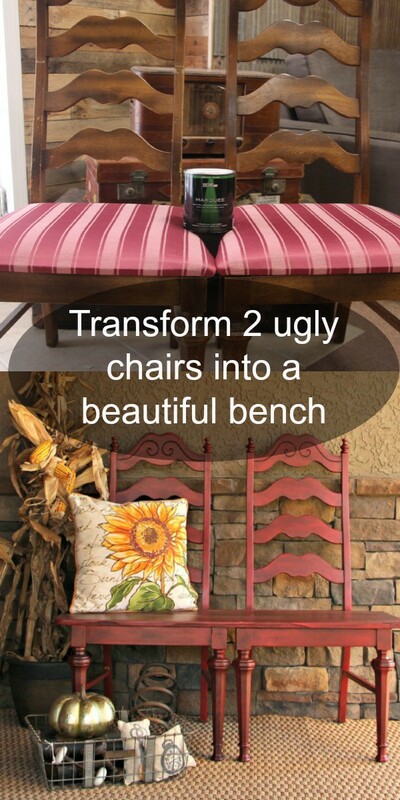 That is exactly what happened when I saw these chairs at a garage sale for $2.00 each. I snagged them up and turned two of them into a Chair Bench. Since then, I always gauge the paints I use by how well the deeper, darker colors cover. You can buy a separate primer and have it tinted close to the color you are using but that is an extra product I have to buy plus another brush and roller I have to clean. Seems like a lot of extra work and expense. 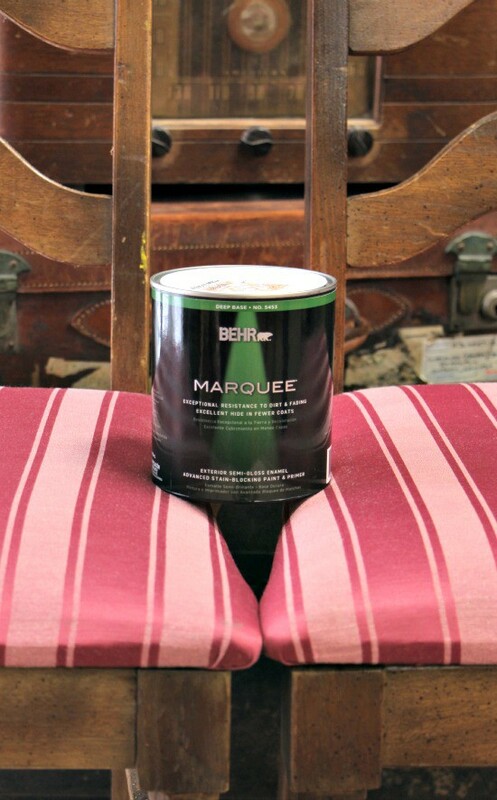 After researching the new paint options on the market, I opted to try BEHR MARQUEE® Exterior Paint & Primer. It is a paint & primer in one. What does that mean? It means I can use the paint as my primer first. 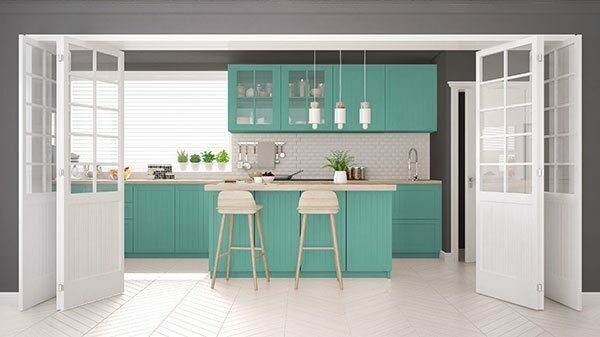 For example, if I am painting over raw wood, I can apply 1-2 coats of the BEHR MARQUEE Exterior Paint & Primer as my primer and then apply the same BEHR MARQUEE Exterior Paint & Primer product as my paint. Umm…hello? Why not buy a paint & primer in one to save time and money? 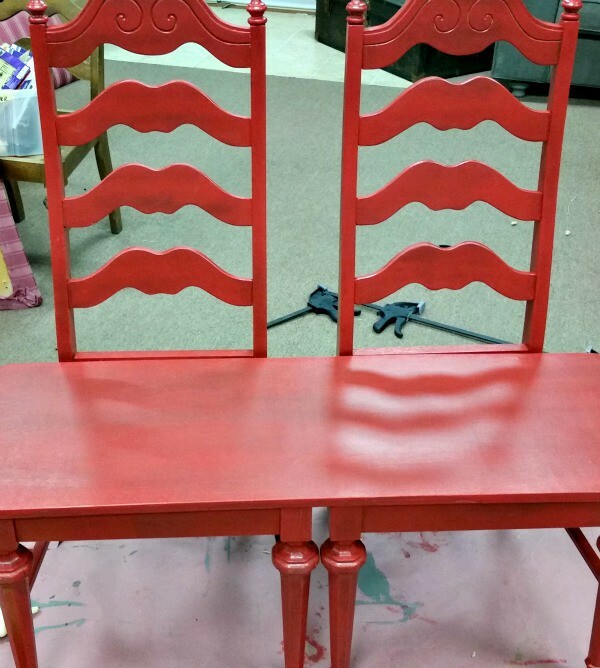 Because this bench would ultimately be going on my porch, I selected an exterior semi-gloss enamel finish. It is formulated to create a hard, durable finish to withstand wear, and resist moisture, fading and stains. 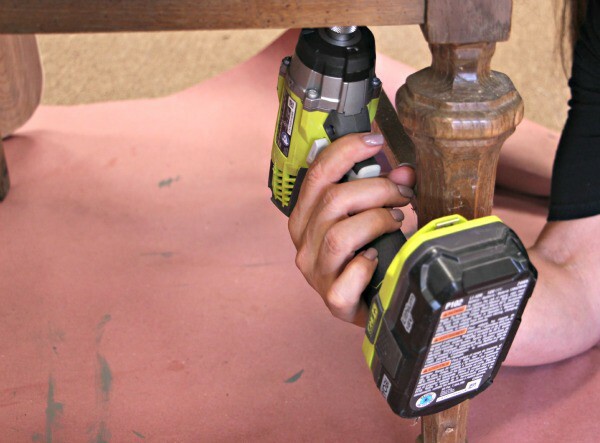 1) Use a drill or screwdriver to remove the screws from underneath the chair. This will release the chair cushions from the frame. Save the screws. 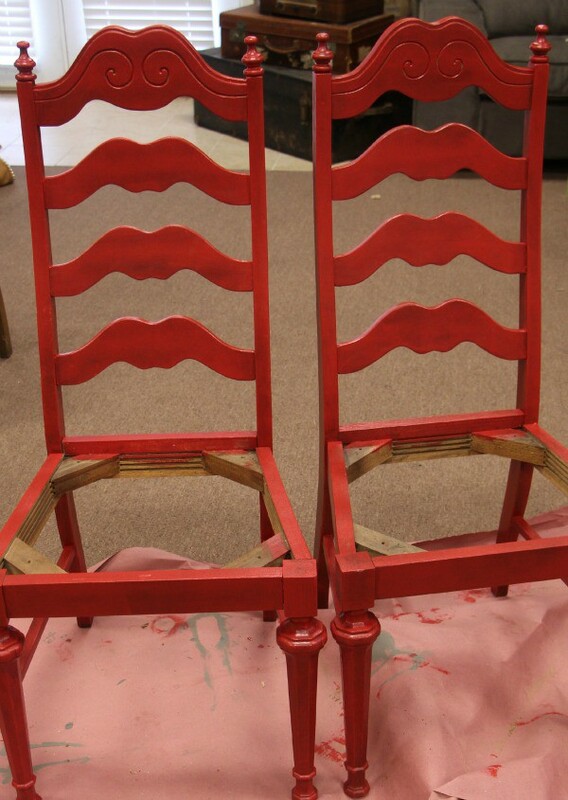 2) Sand the chair frames with 220-grit sandpaper to etch the surface. 3) Clean dust and grime with TSP (tri-sodium phosphate) and a damp rag. 4) Wipe once more with a clean damp rag and water. Let air dry. 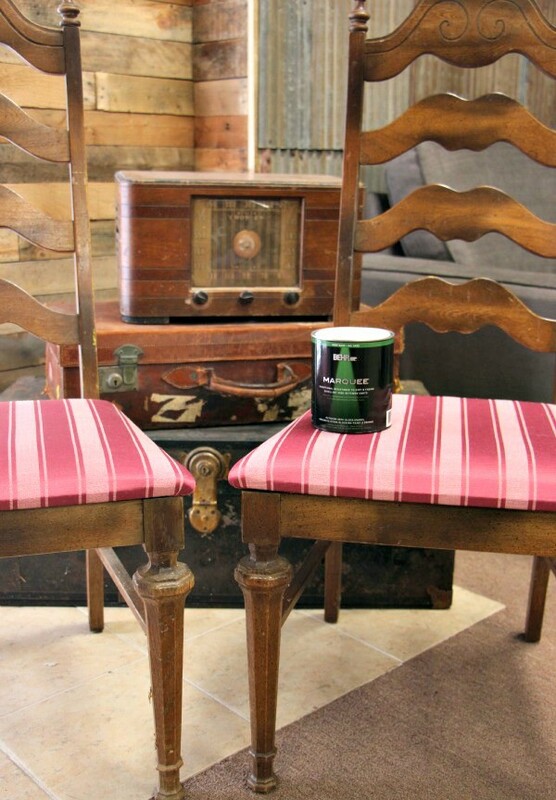 5) Apply one coat of BEHR MARQUEE Exterior Paint & Primer as the tinted primer coat. 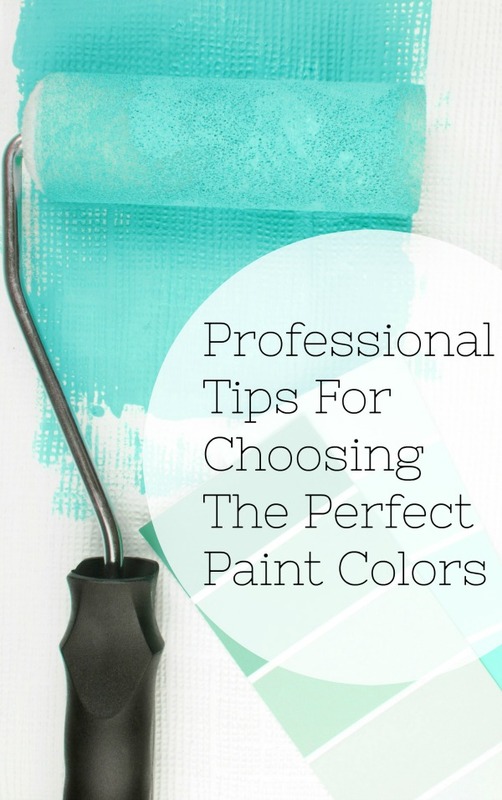 (This step is typically necessary when painting with the deep-tone colors). Let dry one hour. 7) Put the 2 chairs together to get an accurate measure for the bench seat. 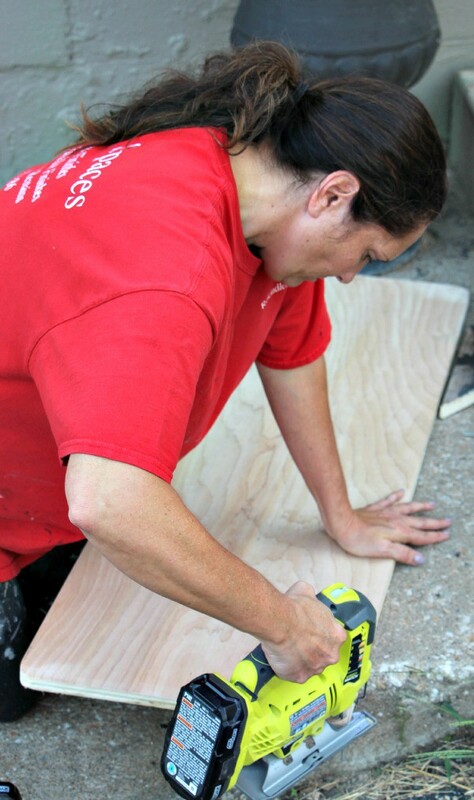 I took my measurements with me to the hardware store and had them cut the plywood while I was there. (They won’t round the corners for you but I took care of that when I got back to the shop. 8) I took my jig saw and rounded off the corners for my bench seat. 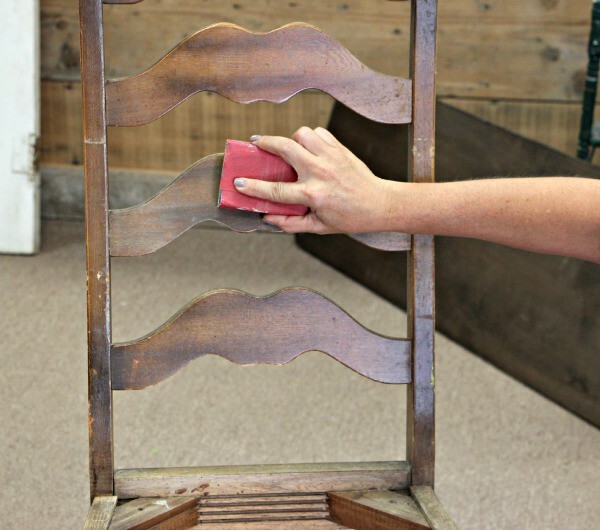 9) Apply one coat of paint to the bare wood to seal the wood. Let dry one hour. 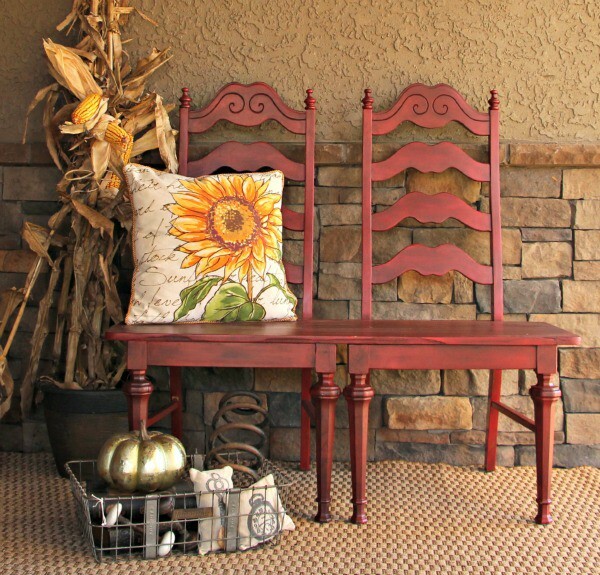 11) Place bench seat on top of the 2 chair frames. 12) Grab the screws that were used to secure the cushions. Screw them into the wood from the bottom using the same holes. 13) After 24 hours, I glazed it with a black wash to give it that aged, worn look. Very nice! Love your choice of color! I've wanted to do this for a while now. They look great! 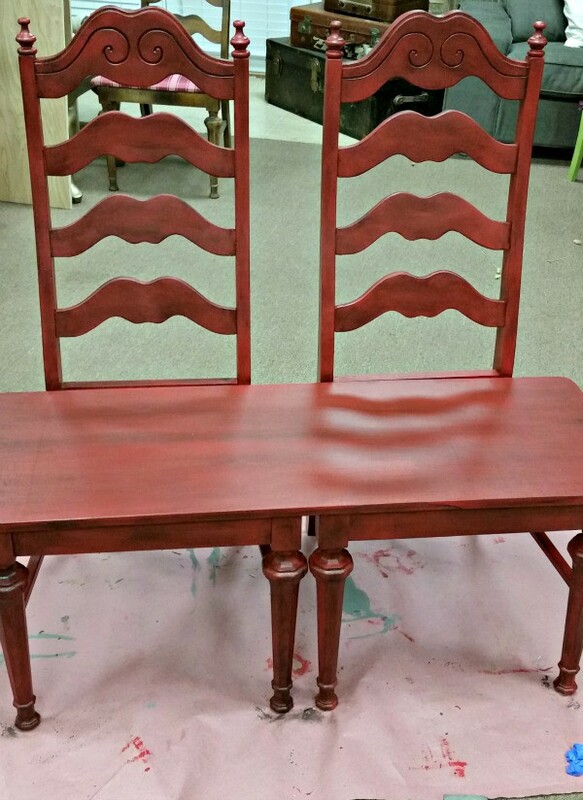 Love the fact that you used the Behr paint. It's really a great alternative and so durable. Love the color, too. My guess is that lots of folks have a set of chairs they'd love to turn into a bench. 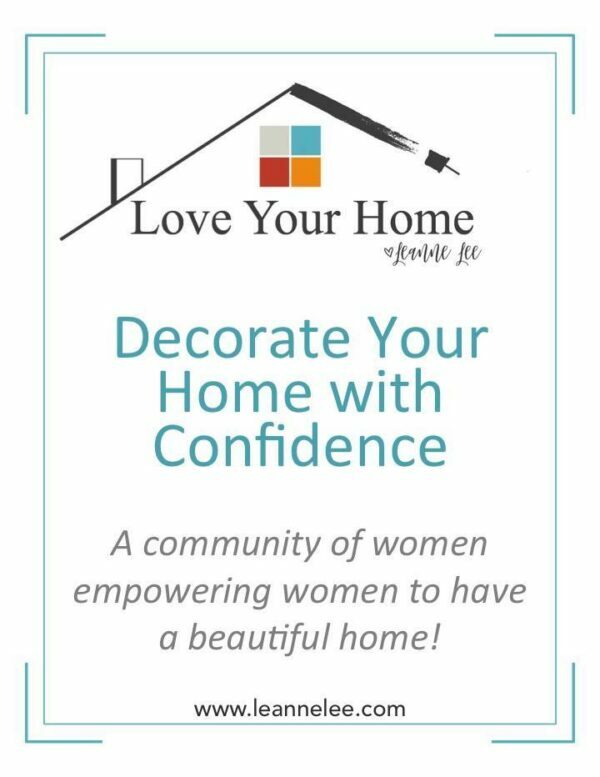 We are so thrilled to have you link to Friday's Furniture Fix.